Arachnid Guy | Barbie Who? My husband spent some time this morning playing with our baby. During this time, he finally noticed the Spider Man action figure I bought a few weeks ago. He thought it was cool at first, but then he said it was probably a cheap knock-off action figure. 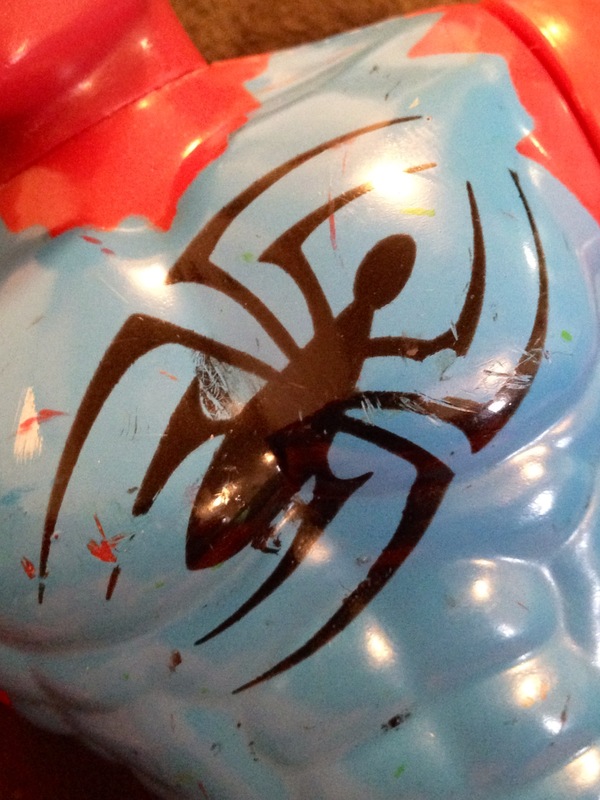 He was suspicious because the torso was blue instead of red and the spider logo was the wrong shape and orientation. We joked around and said it was probably sold under the name Arachnid Guy at a dollar store (he doesn’t look at all like Spader-Man, but I can totally see him hanging out with Robert Cop). His authenticity doesn’t make any difference to me because I am going to turn him into a fabulous monster. Still, I thought it was amusing and wanted to share. I am currently doing a practice outfit because working with tiny yarn in a dark color is harder than I anticipated. I will get something posted as soon as I am done, and then I will start posting about pieces made for Cofelia. Until then, long live Arachnid Guy!! Ha! That’s pretty wonderful. What’s even better is as long as it’s similar and depending on the age, kids won’t notice the diffference. Long live Arachnid Guy indeed!